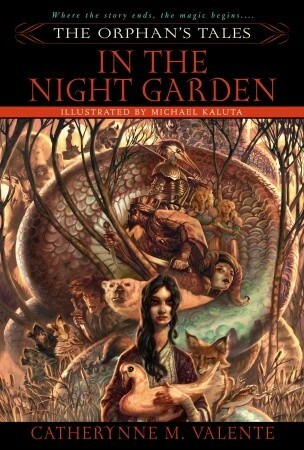 In the Night Garden by Catherynne M. Valente. Bantam Dell, 2006. Paperback. 483 pages. I've been debating for a while on whether or not I wanted to try to write a full review for this book, but it was just so beautiful and engrossing it has continued to stick with me quite some time and I really want to share it with you all. Just a note: this review will only cover the basics of this book, as it's hard to go into detail about this book without writing far too much than anyone would actually want to read. I have loved Valente's writing ever since I first picked up her Fairyland series, and then onto Deathless and Palimpsest, and I have yet to meet a book of hers that I don't enjoy, but I honestly did not expect to enjoy this one as much as I did because of the formatting. Somehow, though, Valente made it work in her usual magical, captivating manner that completely pulls me in. 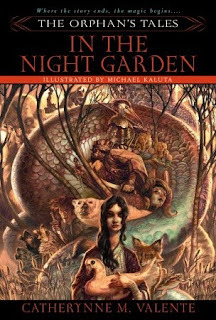 In the Night Garden is written in a format inspired by The Thousand and One Nights, which includes an ongoing frame story that contains many stories within. With In the Night Garden, however, the basic premise of a story within a story turns into yet another story within that story, and another story in that one, and so on and so forth. For example, the book begins with a young girl telling a young boy a story, and one character in that story then tells another character their own story, and that idea continues, delving deeper and back out of the story, coming back to the frame every now and then to push the dialogue forward. I really did not at all expect to love this as much as I did, as I'm actually not usually that much of a fan of people telling stories within stories, but somehow each tale managed to fully capture me. The characters in this collection were all so dazzling in their unique portrayals and their own strengths, each of which was different from the last. All of our main protagonists have fascinating, complex stories and are shown to be very strong people with each showcased in their own way that is displayed at some point in each magical tale. There are influences from so many myths and cultures, from Grimm's Fairy Tales to The Arabian Nights and so much more. If you are at all interested in fairy-tale and myth-like stories,t hen you must pick this one up. There are endless magical events such as animal transformation, witches, and so much more. ...and so many more. I have so many marked passages from this book. Overall, I've given In the Night Garden five stars! I really never expect anything less from Valente, and I can't wait to continue devouring the work I haven't read by her.